“Life Renewed” is a transmedia educational environment tells the story of the plant and animal life that has returned to Mount St. Helens since the eruption in 1980. 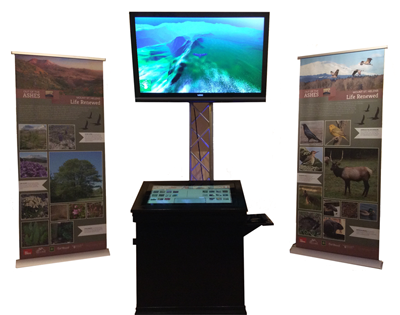 It includes a mobile app and an interactive installation that provides 1) a 3D simulated flyover of the volcano, 2) two augmented reality banners that reveal 2D hand-made illustrations and 3D animation models, and 3) a touch screen interface for identifying plants and animals found on the mountain. It was built for the Mount St. Helens Science and Learning Center by seniors of the Creative Media & Digital Culture Program at Washington State University Vancouver. The interactive installation provides a game environment whereby visitors take the persona of a raven and soar over the mountain. As the raven flies over the 289 sq. miles of hand-mapped terrain, it can interact with the life it sees below. Its flight is captured for the larger audience in the room via a large high resolution monitor. On the touch screen found on the cabinet display visitors can access detailed information about the plants and animals that the raven sees. Tapping on one of the images of the plants and animals on the screen takes the raven to that object. On each side of the monitor are two eight foot banners enhanced by augmented reality technology (AR) that make it possible for visitors not involved in the game to interact with the installation. These banners are divided into the plants and animals found in the game. Using the camera on a mobile device that has downloaded the augmented reality app created for the project, visitors can access ten 2D hand-made illustrations of plants and ten 3D animation models of the animals. A special mobile app created for the project makes the visitors’ phones AR-ready and offers a special scavenger hunt that visitors can use on their next trip to the mountain. “Life Renewed” has won 1st place in two research competitions in 2015. It was showcased at “Move, Touch, Feel” exhibit hosted at Angst-Nouspace Gallery from December 18- January 15th. It was featured at the Columbia River Economic Development Council’s 1st Quarter Luncheon and the City of Vancouver’s Mayor’s State of the City address on Thursday, March 26, 2015. It will also be featured at “The Legends of the Blast,” event held at Kiggins Theatre on May 14, 2015. It will be installed at the Mount St. Helens Science and Learning Center on May 15th, 2015. It is being filmed by KOMO TV to promote WSU across WA State, on September 9, 2015 and will be featured at the CMDC’s booth at the Portland Mini Maker Faire on September 12-13, 2015 at OMSi.